Denied the 11th straight win by the team mate! “Finally”, said my brother to me as the 11th race of this year’s MotoGP came to its end. I am sure many around the world who watched the race would have said the same thing. It appears that the 11th consecutive win was coming too soon for Marc Marquez. On his 29th appearance for the MotoGP race, the 21 years old Spaniard was on pole and looked to have a typically successful weekend at the Brno circuit. Yet, the current world champion could not achieve the perfect result this time around. Like in Indianapolis, the race occurred under the cloudy sky but the weather remained dry. The weekend saw few events as it progressed to the race day. Valentine Rossi crashed during FP4 and injured his little finger on the left hand leaving himself in much pain. He actually had set the fastest lap in FP4 before crashing. Consequently, the Italian was qualified 7th fastest on the grid. Not a good position to start a race if you want to challenge for the win. Also, Alex De Angelis replaced Colin Edwards to race for Forward Yamaha for the remaining season. On the starting grid, while Marc Marquez occupied the top spot, he was accompanied by the two Ducatis of Andrea Dovizioso and Andrea Iannone at 2nd and 3rd spot respectively. This is the first time since 2006 that two Ducatis have been on the front row for a race start. Row 2 was headed by Tech 3 Yamaha’s Bradley Smith followed by Marquez’s team mate Dani Pedrosa on 5th and Movistar Yamaha’s Jorge Lorenzo at 6th. Valentino Rossi headed row 3 at the 7th spot. He was accompanied by LCR Honda’s Stefan Bradl and Tech 3 Yamaha’s Pol Espargaro. The 22 laps race started as the lights went on and off. Pramac Racing’s Andrea Iannone (Ducati) had the best start from the front row and led the pack heading into turn 1 followed by factory Ducati’s Andrea Dovizioso. Lorenzo, Pedrosa, Rossi and Marquez. Jorge Lorenzo, who had set the fastest time early in the morning’s warm up, was quick to overtake both Dovizioso and Iannone for the lead and displayed amazing pace early in the race. He started building up a small gap almost instantly while other factory Honda and Yamaha riders continued their fight to get in the front. Lorenzo’s YZR-M1 was also shed with the soft front tyre which allowed the Spaniard to have good grip from the first lap itself. Especially, the low track temperature early on due to the cloudy weather also aided his soft front tyre to find good grip quicker than the others. Seeing Lorenzo building a gap, Pedrosa soon launched his attack on Dovizioso and passed him for the 3rd position. The Repsol Honda rider soon bested Iannone as well and started to chase down Lorenzo. All this happened between laps 1 and 2. Meanwhile behind them, Marquez and Rossi were already in a battle of their own as they looked to improve their respective positions. Since the race was still in the early stages, the top six riders – Lorenzo, Pedrosa, Iannone, Dovizioso, Rossi and Marquez were more or less close to each other. In the next few laps, Marquez made a pass on Rossi but faced some good challenge from Andrea Iannone. The two indulged in a very tight battle as they exchanged passes corner after corner. It was reminiscent of their days in Moto2. Iannone and Marquez even touched at least twice during their dogfight. It was quite fantastic to see Iannone putting such a tough fight against the championship leader. When Marquez had eventually stuck his move on Iannone, the Pramac Racing rider instantly came under pressure from Rossi. The nine times world champion, however, did not face much difficulty in overtaking Iannone and continued his charge to stay with Marquez. Dovizioso, meanwhile, was slowly losing positions and relegated to the back of this group. Five laps down the race, Pedrosa got close enough to Lorenzo and made a successful pass on his fellow country man. From thereon, Pedrosa led the race and remained unchallenged till the finish. From thereon till about the half race distance, top positions were like this – Dani Pedrosa, Jorge Lorenzo, Marc Marquez and Valentino Rossi. Ducati’s Iannone and Dovizioso indulged in a close battle for fifth till the remainder of the race. From the performance that we have come to see from Marquez this season, it was expected that he will close the distance to the two Spaniards ahead of him and will (probably) take the lead as well. However, the race didn’t have too many laps and the distance between himself and Lorenzo and Pedrosa appeared a bit too much this time around. As the laps went by, Marquez didn’t seem to make any solid progress for a better position but Rossi started to close his gap on the young Spaniard tenths by tenths of a second. With 10 laps gone and 12 laps remaining and top four positions still the same, could it actually be the day when Marc Marquez would be defeated for the first time in 2014? With couple of laps more into the race, Rossi was within the breathing distance of Marquez. To the crowd’s delight, Rossi made a pass on Marquez with 10 laps remaining as the board displayed. Marquez fought back and remained close for some time but could never really come close enough to Rossi to try and reclaim the last podium position. The gap between them kept on increasing slowly and Rossi too was unchallenged till the end of the race. To his and the team’s delight, Dani Pedrosa won the race from the Movistar Yamaha pair of Jorge Lorenzo and Valentino Rossi… and from Marz Marquez. This is Pedrosa’s 26th premiere class win. Lorenzo finished in 2nd and Rossi in 3rd. 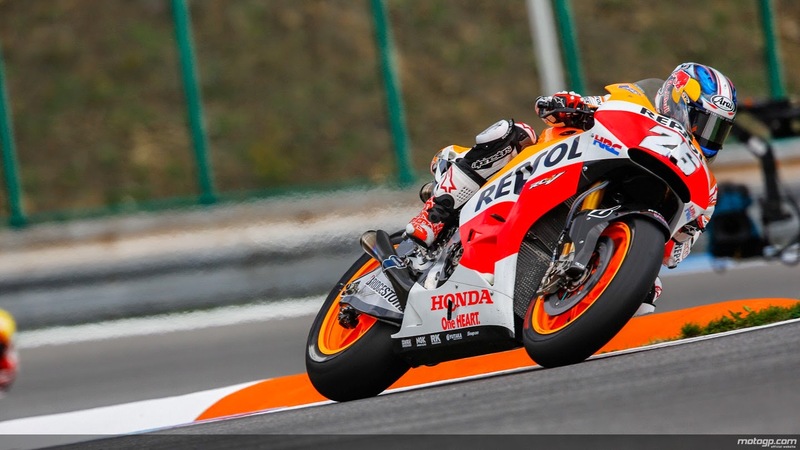 Marc Marquez finished in a “shocking” 4th spot with almost ten and a half seconds behind the race winner Pedrosa. Andrea Iannone won the fantastic battle against Dovizioso and finished the race in fifth place. Andrea Iannone will join Andrea Dovizioso in the factory Ducati team next year. In his post-race interview, Marc Marquez was absolutely gracious in his defeat and simply acknowledged that he and his team could not find the perfect race set up throughout the weekend. It seems that the so far unstoppable Spaniard finally succumbed to a situation where the setup didn’t work in his favor, something against which he seemed almost immune so far. The top 3 finishers were naturally happy that they finally beat Marquez even though they agreed that this could be one of those unlucky days for the current world champion given his performance in the last 10 races. Rossi in particular was very pleased with his result since he raced with an injured finger. Marc Marquez continues to lead the world championship with 263 points total so far. He leads his team mate Dani Pedrosa with 77 points. Pedrosa is 2nd in the world championship at 186 closely followed by Valentino Rossi in 3rd with 173 points.